The Duke University Talent Identification Program proudly presents Academic Adventures at Fort Worth Country Day in Fort Worth, Texas. Academic Adventures consist of one full day of intensive academic study, where fifth and sixth-grade students choose a topic not typically covered in school. The program offers hands-on learning experiences with motivated peers in an environment where creativity and critical thinking meet. As a participant in the Duke TIP 4th-6th Grade Talent Search, your child has the opportunity to participate in Academic Adventures, where students engage in learning, thinking and creating. 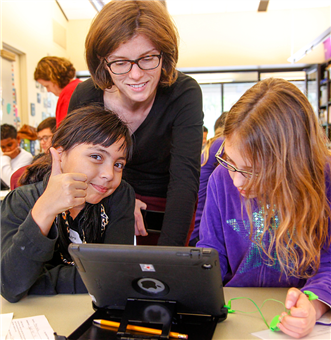 This enrichment program offers challenge and excitement for gifted students. Only fourth, fifth and sixth-grade students with a current Duke TIP identification number may register. Our Spring Duke TIP Academic Adventures Program will be held on April 6, 2019. Course descriptions can be found below. Note: This program is only open to fourth, fifth and sixth-grade students who have participated in the Duke TIP 4th-6th Grade Talent Search. Only students with a current TIP ID number should register. All courses are offered April 6, 2019, will cost $150.00. The tuition includes academic activities/supplies and an afternoon snack. Please note, due to the wide variety of dietary restrictions and allergies of participants in our programs, students must bring their own lunch to the Spring 2019 Academic Adventures program at FWCD. Please note, due to the wide variety of dietary restrictions and allergies of participants in our programs, students must bring their own lunch to the Spring 2019 Academic Adventures program at FWCD. Refrigeration is not provided for lunch storage; lunches will be kept in an air-conditioned space prior to the lunch period. Guardians will have an opportunity to note their students' allergies and dietary restrictions when registering, and our Academic Adventures staff will oversee lunch in our Dining Pavilion to maintain a safe environment for all participants. Students will use simple CAD software to design truss bridges. The students will use a CNC router to cut the components of their bridges from wood stock. The bridges will be assembled and bench tested for their load-bearing strength using Vernier testing equipment. Students will learn about the different types of truss bridges as well as the concepts of compression, tension and torsion. Do you like to create and build? Are you a good problem solver? Then this is the course for you - We will be strategizing on keeping Barbie from getting a Concussion, saving an astronaut from sure death, building strong structures to Withstand natural disasters, and launching supplies to reach behind enemy lines. We will be working in small collaborative teams and gaining more insight into the engineering design process. Come experience a hands-on exploration of the human body! We will be looking into the structures and functions of several human body systems and how they work together to make our incredible human body. Students will be introduced to the Engineering Design Process while designing and constructing a Marble Drop. The ultimate goal of the project is for teams to maximize the time the ball moves through a 2’ x 2’ x 3’ volume, without ever letting the ball come to rest. Participants will learn about potential and kinetic energy in order to construct various obstacles such as mazes, zig-zags, see-saws, roller coaster waves, marbles wheels, jumps, plinko boards and more. This program aims to teach the essentials of financial literacy through the board games Monopoly and Acquire while also considering whacky ideas about the future of economics through critical discussions. In between rounds of ferocious financial competition, we will consider the broader implications of how our saving, spending, and investing shape our communities. Like many art forms, movies begin in the minds of people. One of those people could be you! Screenwriters create all the moments you’ve come to love in your favorite movies and television shows. They are the ones who craft the catchy dialogue of the characters you quote. In this course, we will preview the unique writing style and format screenwriters use to launch the first phase of the movie-making process. We will also carefully watch short films and analyze their structure. Finally, we will write pitchable loglines for films you would like to write. Learn French as you solve a mystery in and under the streets of Paris! You are a secret agent working for the United States government. Your mission is to solve the case of a mysterious disappearance. Having never studied French, you must learn the language to solve the mystery! Accept the mission, search with the secret map, discover Paris and its food, crack the case, and submit your mission report. This class is designed for beginners. 1. Complete the FWCD Duke Tip Financial Aid Application and the Academic Adventures Course Preference Form. You can view the course options on our Duke TIP website or on this webpage. 2. Submit the completed application, all supporting documentation, and the Academic Adventures Course Preference form to Angela Benson in the FWCD Business Office no later than March 20, 2019. Submit application and documents online. Applications will be reviewed on March 22, and applicants will be notified about award decisions on March 23, 2019. At that time, instructions will be given on how to complete the enrollment process. Check-in begins at 9:30 a.m. Courses begin promptly at 10:00 a.m. and end at 4:00 p.m. All classes meet on the Fort Worth Country Day Campus in Fort Worth, Texas for one day of intense academic study. 4pm: Dismissal, students depart with parents. What to Bring: - Notebook, pencil, and pen. Wear comfortable clothes (jeans or shorts are fine for class) and shoes that are suitable for walking. A raincoat or jacket is recommended for inclement weather. Check-in is located at the Fischer Dining Pavilion campus map. Cancellations must be requested in writing ten (10) business days prior to the scheduled program date to ensure a refund of tuition minus a $10 non-refundable registration fee. Should the Participant leave the Duke TIP Program for any reason other than a death in the immediate family (mother, father, guardian, or sibling only) or an illness, which requires hospitalization, after the fee deadline set by Duke TIP has passed, there will be no refund of any fees. Should the Participant leave the Duke TIP Program as the result of death in the immediate family or an illness that requires hospitalization, Duke TIP will provide a prorated refund not to exceed 50% of Program fees. Refunds will take approximately one month to process.